Home > Google News > Find Your Lost/Stolen Camera With Google Images? Find Your Lost/Stolen Camera With Google Images? A Google Web Search Help thread has one Google user asking if it is possible to use Google Image search to locate his stolen camera. He said, many cameras add a unique identifier to the images within the image in the exif data. If Google let you search images by exif data, maybe he can track down pictures taken with it by the person who stole the camera. Maybe he can then give this information to the police and get his camera back? I should note, there is a search engine like this named Stolen Camera Finder and it either asks you to upload an image you took with the camera you lost or enter a serial number from your camera. If it can locate images with that camera's serial number then you may be in luck. Thanks for this really interesting feature request! This could be a great use case for our recently launched dynamic landing pages. 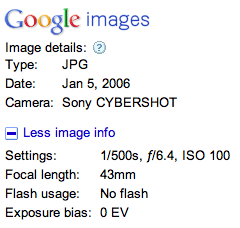 These pages can include EXIF information that is stored within the image itself. Here's a random example. I'll make sure to take this request back to the team! What do you think of this idea? Potential privacy issue or a good way to help users track down their cameras?